Abstract: In criminalistics handwriting examination is applied mostly in the comparative scope. However, rising popularity of application of graphology in interdisciplinary scope of humanistic and sociological studies in Western Europe presents opportunities, which this discipline could offer in the field of criminalistics and criminology. Nowadays, graphology is commonly used in the purpose of extracting symptoms of certain mental and neurological diseases. Moreover, graphological experience confirms that the handwriting analysis creates the possibility for extracting of features of emotional suffering. This article refers to certain reflections on handwriting pathology, which is distinguished from general notion of pathology defined as illness. Handwriting pathology concerns suffering in general sense of human existence. Furthermore the article presents certain examples of grapho-pedagogical intervention in Italy. Concerning on the aspect of pathology of a certain phenomenon, we face the issue of irregularity, malfunctioning and suffering. However, the term “pathological” evokes the image of an organism in a state of illness, i.e. an unhealthy organism that needs medical treatment. But, the World Health Organization defines health as “a state of complete physical, mental and social well-being and merely the absence of disease or infirmity”[ii]. In other words, the state of health occurs only when one’s body, psyche and soul are guaranteed conditions that are essential for one’s self-realisation. With this short introduction about the concept of heath, I would like to consider the meaning of handwriting pathology in our case, the way the analysis of “pathological” handwriting is treated by contemporary science and what issues it refers to. At the beginning of my reflections I would like to use the thesis of a Polish handwriting analysis expert and judicial expert – Henryk Kwieciński, who in 1933 in the publication “Forensic Graphology”[iii] did not only present various topics referring to the document examination and graphic symptoms of certain mental illnesses, but he also touched the question of the psycho-emotional expression in handwriting. Kwieciński’s reflections from the third decade of the twentieth century (It was the epoch when psychoanalysis was just paving the way to popularity.) on emotional expression in handwriting concerned the issue of spontaneity and unconsciousness, that is the issues, which become the regular part of our personality. As an example of Kwieciński’s work may serve one of many illustrations, which show the value of the opportunity of using the psycho-emotional analysis of handwriting in the juridical studies. The author does not inform the reader about possible diseases and experiences. The signature becomes the measure of one’s suffering. We can compare the samples of the signatures. The one below was made in the presence of the judge after pronouncing the sentence, and the second one (the one above) was made in normal conditions. Over eighty years have passed since that moment, but still the author, or rather her signature, desperately screams with emotions that are hard to control. 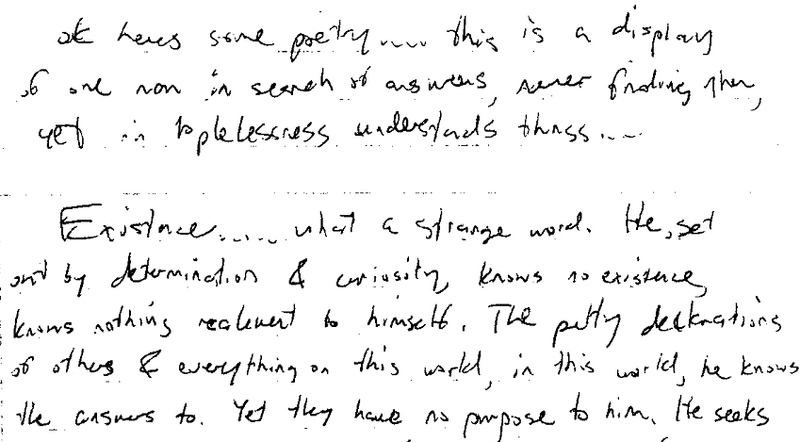 As an observer and a handwriting expert, Kwieciński reaches a conclusion about the dynamics of handwriting. We can even regard him as a one of first scholars concerning on the dynamic graphology. His works about the handwriting pathology go far beyond the definition of a disease showing the far-reaching vision of one’s emotional suffering that is expressed in one’s handwriting. The aspect of “the suffering in handwriting” is a matter of concern of graphologists, who try to extract personality from handwriting as a complexity of human features from bio-temperamental basis to relations with other people, in specific cultural and social environment, which are continuously exposed to faster and harder to prospect dynamics and intercultural and interdisciplinary influences[iv]. In 1924 Moretti – a founder of Italian graphological studies wrote that “the writing made by an arm an a hand can present psycho-motor and psycho-mental functions of the brain […], this is why I am convinced that graphism shows the most delicate nuances of the brain”[v]. We can observe the correspondence between Moretti’s assumption and theses of Klęsk[vi], Elenmeyer and Preyer[vii], who noticed that handwriting is a product of the brain– the center of the most important processes of individual and social life. This concept is similar to Kwieciński’s thesis, who did not only noticed in handwriting symptoms of diseases[viii], but also the expression of emotions. Graphology is, therefore, the discipline that examines graphism in order to find the answer on the complexity of the human being. However, its competences can not exceed the current knowledge about the processes of the human brain and physiology. Although the contemporary knowledge about the possibilities of the analysis of human complexity from one’s handwriting allows to distinguish certain important psychological features of a person, it certainly does not deplete all graphological opportunities. Undoubtedly, the human handwriting conceals much more “hidden information” than the information we are able to see and understand. Just as we are not able to catch and understand the limitless potential and capabilities of the brain. Graphology still meets the lack of acceptance from the scientific world, which is strongly bounded with its apparent mystery that certainly fascinates and evokes the imagination of unqualified persons who search answers in reading of simple publications deprive of scientific inquisitiveness. But, the more careful approach to this discipline allows to solve at least some of “the mysteries” and to understand that every sign and movement do not contain any mysterious arcane but they contain answers on more or less understandable processes that take place in an organism. The organism does not live in isolation, but in a group or rather in inter-relations of social groups, it is immersed in their dynamics, it is influenced by them and it reacts on them and inter-reacts with them. The type of the reaction is addicted on many individual and social factors. We can not agree with the statement that one’s handwriting has much in common with society and its conditions because every serious handwriting examination is based on very simple and simultaneously fundamental statement, i.e. every person learnt to write according to certain school pattern, like everyone was raised according to some pedagogical and didactic patterns. Despite these graphic and educational patterns, proper to different cultures, two identical styles of handwriting do not exist, like there are no two identical persons, even in the scope of one family, because there is a strong connection between graphic and personal maturation. It do not only consist of certain models and patterns, but also of personal characteristics and richness of temperament of every single individual. Despite the process of learning of writing, during which at first we consciously repeat, and then we automatically acquire signs of some general pattern, we are not able to stop expressing our tendencies and personal impulses, which make that every graphism becomes unique and recognisable. Nowadays, the psychological examination of handwriting is more often applied interdisciplinary. It is a matter of concern of many doctors, especially psychiatrists, who through the empiric researches try to exact all forms of human psyche’s sufferings from handwriting. They also seek for answers on the degree and accuracy of the diagnosis from handwriting. 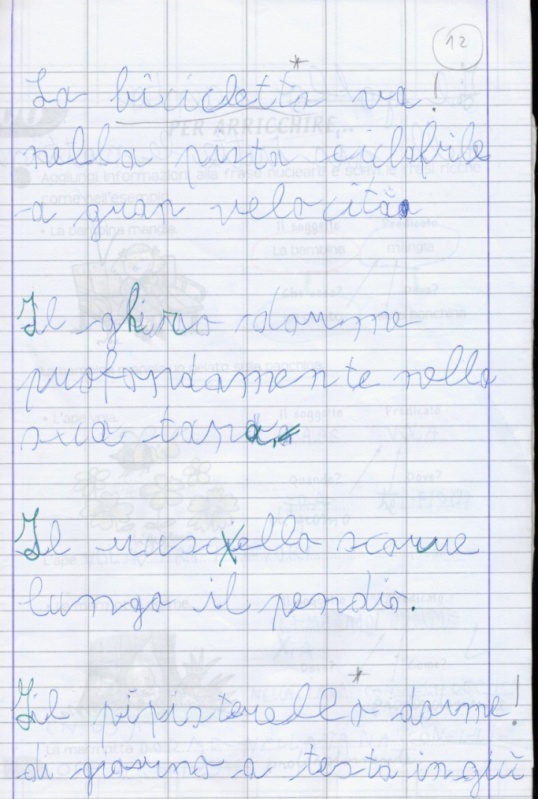 In Italy this discipline is applied in pedagogy, when through the analysis of handwriting and drawings supported with an interview and observation of a child, pedagogue cooperates with graphologist in order to choose appropriate individual didactic plan. The analysis helps to learn about correspondences and discords in the maturation of the individual and emotional processes, social relations and to express the vision of subjective perceptions of one’s hardships and spiritual and existential sufferings. Deeper and deeper psychological examinations corroborate the projection value of handwriting with the special consideration for emotional intelligence. Human psyche, which is a kind of a propulsion, affects on all neuro-physiological processes. This is why the examination of tension and looseness of graphic line and its intensiveness and occurrence are valuable tips in the examination of the tension and looseness of muscles, which operate on “the order” of one’s psyche. Referring to earlier quoted theories of scientists on the graphism as a product of the brain and concerning on specific individual and social pathologies, one should cite the DSM IV[ix] classification of mental disorders, which describes various individual problems with parallel social significance. From the complete list of diseases and disorders, I would like to mention the example of the psychosocial and environmental problems with special reference to disorders of behaviour and emotions that usually begin in childhood and adolescence as intermissions of basic cognitive and emotional functions, which when neglected, unnoticed and unheeded by the environment may become the cause of many individual and social sufferings. They may even lead to tragedy. Children and young people with this type of disorders present aggressive behaviour, lose control and make constant objections. They themselves feel psychological discomfort such as constant anxiety and depression. Usually, the cause of such disorders lays in environmental situations such as failures at school, negligence, feeling of being abandoned by a family or other miseries. Symptoms of these miseries can be noticed in one’s relations with others and oneself, they are also visible in one’s graphism. 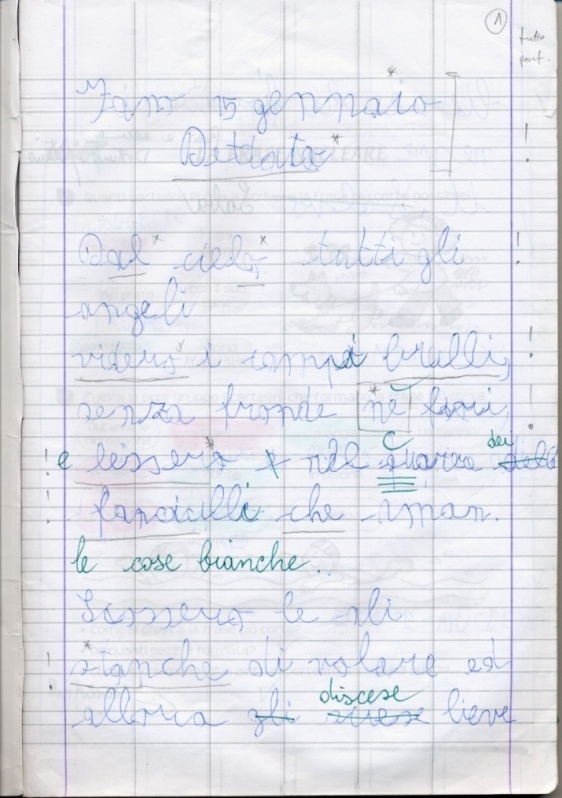 As an argument of this thesis I would like to present two samples of the ten years old boy’s handwriting, who after his father left his family expresses rebellion and distress in his relations with the family and the society as well as in his notebooks. The father was for the child an important benchmark and an authority, who the boy trusted and who unexpectedly collapsed. The former supportive role of the father suddenly lost its sense. The boy felt cheated and betrayed. These feelings of trust and betrayal are visible in boy’s behaviour and handwriting. Before the dramatic event the boy’s handwriting was in order. It showed adaptation to the rules of his environment and the environment’s requirements which are symbolised by the notebook’s lines and margins and the model of calligraphic pattern, i.e. his previous handwriting symbolically expressed compliance with the norms requisite by his environment. After having been left by the father, the boy started to express objections against these rules that no longer had sense for him. Just compare the handwriting on the left made in conditions of composure, with the dynamics of handwriting on the right that was made after the father’s leaving to state to what degree the things that in the child’s eyes presented any authority simply collapsed. Despite that the boy does not completely break all the rules, he respects notebook’s lines and margins in some degree. From time to time he returns to previously learnt rules because they allow him to make relations with others because they are the basis of his hitherto positive experiences of coexistence and social interrelatio ns[x]. The second example I would like to present is a case of another ten-year-old boy with behavioural problems such as a constant lack of attention, inappropriate behaviour in a classroom, acts of aggression, signs of low respect towards himself. All these behavioural factors can be observed in his handwriting: a lack of respect towards notebook’s lines, impulsive motion, moving of pen pressure which is often so weak as it makes reading of the text impossible. The boy was mainly brought up by his grandmother because his parents were occupied with their professional career. This is where the boy’s constant need of being in a center of one’s attention combined with the lack of a sense of self-worth come from. After the graphological and pedagogical consultation, the individual educational plan was specially implement for the boy. Of course his problem with processes of attention, a huge need for motion and especially greater presence of the parents in the child’s life were taken into consideration while creating this plan. Thanks to parents’ serious approach to the issue, within few months the boy developed a good degree of self-esteem, which resulted in better behaviour in a classroom and changes in the form of his handwriting. This is mostly visible in the child’s seeking for the graphic order. The child tries to keep the basic line through the more homogeneous and stronger pen pressure, which informs us that the child more consciously and bravely confirms his self-existence and activity. In this case the child was given a chance and proper conditions in which he was able to develop a sense of dignity towards himself and other people. These are the conditions that put a moral duty of developing them in every single person. This is one of many examples that prove the pedagogical truth that “ a human being is a creature, who when provided appropriate educational and material support is able to fulfill all human functions”[xi]. 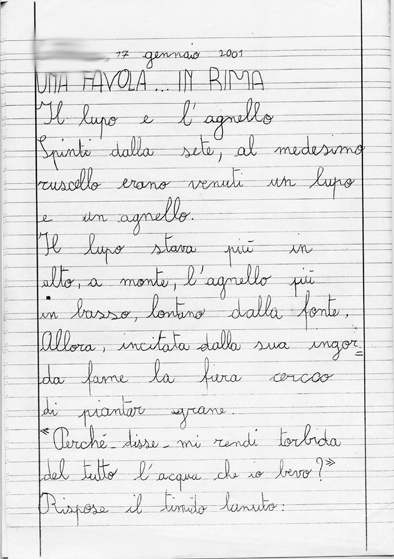 When we consider these examples, which are only a drop in ocean of children’s problems, we should ask ourselves if in the face of the new interdisciplinary approach of graphology, especially of pedagogical graphology, we may use the handwriting examination in order to prevent many social miseries, which are consequences of certain crimes that are the result of human sufferings and improper educational and social relations and dynamics. The process of development of an individual may be determined as a certain constant rhythmicity and recurrence of the developmental processes of every single person, immersed in the dynamic process that undoubtedly has an influence on an individual. The social dynamics in every part of the world as well as in every part of a city, a district or a family are different. Although the dynamics of the human development are identical everywhere. The dynamics of the human development need patterns, social acceptance and an environment, in which one can express one’s existence. If one of these condition is unsettled, if it develops inappropriately, there is a risk of the pathology of a personality or the pathology of an environment with outer “symptoms” of this pathology, that is through behaviour and graphic behaviour. Now, I would like to remind about the tragedy dated on 20 April 1999 that took place at Columbine High School, in which two students, Eric and Dylan, embarked a massacre[xii]. After having killed 13 people, they committed suicide. The investigation stated that the boys were victims of their school mates’ constant derisions and aggression and that they had behavioural problems. In March 1998 the pair was arrested for robbery and theft of a van. They were sent on a special re-educational training, which they finished earlier due to good behaviour. The earlier release was motivated as follows: “Eric is a very bright young man with a great likelihood of achieving success in his life. He is intelligent enough to achieve important purposes with good motivation and concentration on decisions.” And “Dylan deserved to finish the training earlier… He is intelligent enough to realise his every aspiration. He is also aware of the fact that without work and effort it is hard to achieve something”. Eric was submitted to a special programme of anger control, but he was released from the therapy in a short time because he made a good impression on officers. Everything seemed to be on a good path, the boys made a good impression. But few months later the tragedy happened. No one from the boys’ families noticed firearms that were being stored for months. The number of the firearms was sufficient to blow a whole district up. No one, neither parents nor teachers noticed anything alarming. After the massacre and the boy’s and their victims death one started to analyse the boys’ diaries. They were full of plans of attacks preparation, with ground observations and hours proper for killing few hundreds people. Due to the fact that the plan was successful only partially, they did not manage to kill hundreds of people. From the contents of their diaries one can distinguish two extremely different personalities. Eric, with strong temper, longed for respect and recognition in his own environment. Facing derisions and pressure he was determined to “gain a respect” using violence. He was driven by the feeling of harm and revenge. Dylan, whose shyness and submission became the cause of other’s violence towards him, found a friend in Eric, who appreciated him showed the way to assert his rights. The contents of both diaries present extreme suffering and craving for revenge. The dynamics of graphism present identical characteristics. Dylan’s handwriting, as showed below, presents many irregularities mainly in the weakness in keeping the basic line, which is a symbolic expression of instability, a lack of appropriate benchmarks and fears of unaided solving of problems. Eric in his graphism is violent and vulgar (also in his language). Within few months his handwriting changes completely because of the fear that their plans about the massacre may be revealed. He decided to conceal himself. He wrote about it in his diary. The handwriting above, which was made on 21 April 1998, that is a year before the massacre, presents: gesture impulsivity – visible mainly in the lines crossing the “t” letters that are out of control, a lack of control and indispensable consideration – visible in words’ impetuousity that are almost joined together, an impression of filth and negligence, carelessness and lack of legibility. The fear of betrayal of his plans, led Eric to control his behaviour. This control is also visible in his graphic gesture, his energy and momentum which is the cause of high accumulation of tension that results in trembling, in sudden short breaks in the graphic line. These features are typical for the elderly people’s handwriting. 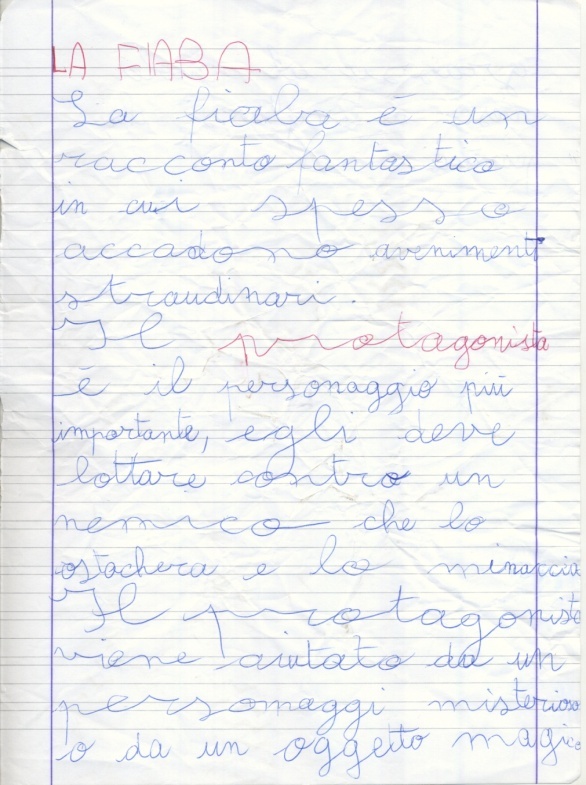 As it is the handwriting of the boy in the peak of his powers, it is impossible not to notice the fact that the graphism is shrunken and impeded, his energy is suppressed to the limits of suffering and waits for the appropriate moment to explode, which is noticeable in the handwriting sample above that was made on 3 April 1999, i.e. seventeen days before thee massacre. The example of the changes in Eric’s handwriting, which happened within few months, shows his inner suffering which no one surmised about. The Columbine tragedy is not an isolated case in its kind. According to the researches that were made by the Office of Juvenile Justice and Delinquency Prevention, 10 % of the inquired adolescents admitted that they brought firearms to school. In years 1997-1998, 506 students were dismissed from their schools for this reason, which indicates 18 percent increase of armed students in comparison to the previous year[xiii]. Facing this kind of problem, schools feel helpless. Some of them guarantee a presence of a policeman. Alarming gates, cameras and higher fences were proposed. The new Office of Safety in Schools in California prepared a list of 20 warning signs in juveniles’ behaviour. The American Psychological Association in cooperation with MTV published a handbook “Warning signs: Suggestion for Preventing and Dealing with Student Initiated Violence” in which criminologist William Reisman presented a list of 50 warning signs. President Bill Clinton’s initiated a special project “Early Warning- Timely Response: A Guide to Safe Schools” which was distributed among American schools. It was supplemented with comments of the National Organization of School Psychologist and the Department of Education. The guide exacts 16 characteristics that may distinguish children with tendencies to violence, with tendencies to social isolation, feeling of alienation and low school results. “ Some warning signs exist for sure [..] Although classification of children on the basis of the fact that they somehow differ from standard norms is not a good idea” – says Elizabeth Kuffner from the American Organization of School Pedagogists. These signs really exist, they are within the reach of teachers and parents. Although they are visible in grapho-linguistic expressions, they are rarely taken into consideration. Concerning the diagnostic value of handwriting from the other point of view, it is worth to remind the famous case that happened 25 years ago i.e. the case of examination of authenticity of Hitler’s diaries, in which participated: the Federal Criminal Police Office in Wiesbaden and three most famous experts, one from the USA and a noted handwriting expert from Switzerland[xiv]. They were to verify the authenticity of diaries which STERN magazine was offered to buy from Konrad Kujau for 9,3 millions Deutschmarks. The experts had access comparative materials such as samples of Hitler’s handwriting made in various decades, which were provided by the seller and the National Archive. The Archive gave the experts copy of Hitler’s last will and his various signatures. All qualified experts, working separately, agreed that the diaries and the comparative material were written by the same person. But, after the purchase of the diaries by the magazine, the Federal Office of Materials Examination stated that some types of the examined paper were not in use in the time when the diaries were allegedly written which means that the diaries are certainly false. During the explanation of the process of this precedent, it turned out that the expert did not make any comparative mistake in the document examination because the material that was examined by the experts did not belong to Hitler but to Kajau, who prepared all document personally and supplied them to interested in transaction as Hitler’s manuscripts. The documents from the archive were not even taken into consideration because they were available as copies. As a consequence of this scandal the STERN magazine was accused of improper approach to the issue. The accusations came mainly from the president of the Federal District of Wiesbaden, Dr Wolfgang Steinke and Prof. Dr Lothar Michel from the University of Mannheim. Michel ask BKA (Bundeskriminalamt- German Criminal Police) why they did not use simpler methods of the document examination if they had an access to the documents that allegedly belonged to Hitler. Instead they chose and applied more complicated and more expensive destructive methods of paper examination. These “simpler” methods were supposed to be graphological handwriting analyses, which would probably help to extract at least few features of the personality of the documents’ authentic author and it would raise suspicions about their authenticity. Whereas Steinke said that “the opportunities of document examination” can not be totally exert if one uses toward them unnecessary scientific methods[xv]. He cited contentions of American handwriting experts that were published in 1982 on 37 annual meeting of the American Society of Questioned Documents Analysts. During this conference the need for better cooperation between document examiners and humanistic studies such as psychology and psychiatry was expressed. The society asked their Anglo-American friends to consider this type of researches[xvi]. May the psychological analysis of handwriting, which goes beyond the comparative expertise, really be useful in criminalistics to ascertain the authenticity or the unauthenticity of one’s signature on the basis of exacting characteristic features of the writer’s personality? Would in this context the handwriting examination be able to signalize situations of individual’s suffering, which go beyond the definition of physical suffering as a symptom of some kind of disease? Would it be helpful to signalize one’s special “warning situations” such as social hardships that lead to violent behaviour or behaviour that presents the risk of committing suicide? It is hard to answer on this question in unambiguous way without making practical use of this discipline in this scope. It is truth that the suffering visible in one’s handwriting goes far beyond the issue of clinical disease and beyond an individual person giving the chance to individual and group pedagogical planning. The graphological analysis becomes the valuable help in crime prevention. Furthermore it may become an effective and reliable instrument during investigations and during the process of establishing the culprit of the crime. Klęsk, A., Psychophysiology and pathology of handwriting, Książnica-Atlas, Warsaw, 1924. Kwieciński, H., Forensic Graphology. Principles of document examination and handwriting analysis., Biblioteka Polska, Warsaw, 1933.
WHO, The Declaration of Alma-Ata, the International Conference on Primary Health Conference, 6-12 September 1978, Alma- Ata, USSR. [ii] WHO, The Declaration of Alma-Ata, the International Conference on Primary Health Conference, 6-12 September 1978, Alma- Ata, USSR. 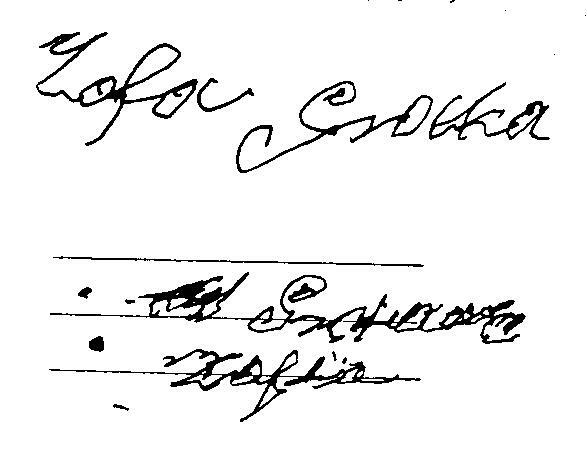 [iii] Kwieciński, H., Forensic Graphology. Principles of document examination and handwriting analysis., Biblioteka Polska, Warsaw, 1933. [iv] Grębowiec Baffoni J., Studi sulla scrittura in Polonia. Dalla grafologia alle recenti ricerche sui documenti. L’analisi delle scritture in criminalistica. Sulla rotta del sole, Mesagne 2010, p. 40. [vi] Dr Adolf Klęsk founded a school for victims of the I World War. The purpose of the school was to prepare disabled people to return to their social and working environments through reeducation and recovering their physical abilities. The doctor wanted to teach to write people devoid of upper limbs. As a result of his work many people without one or two hands learnt to write with the other hand, foot or lips. This activity gave the disabled men the opportunity of realisation in their family and social life in best possible way. It also gave the doctor the opportunity to made important observations on influences of writing activity on the psychological development. According to Dr A. Klęsk, the use of the hand that is less dexterous in writing affects in the rise of psychological capabilities of the writer. He assumed that writing with both hands results in higher development of psychological processes. Klęsk, A., Psychophysiology and pathology of handwriting, Książnica-Atlas, Warsaw, 1924. [vii] Vettorazzo, B., Teoria e pratica del diritto. Metodologia della perizia grafica su base grafologia., Giuffre Editore, 1998, p. 52. [viii] Kwieciński developed the issue of graphic symptoms of mental illnesses as well as neurological diseases which were at that time treated as mental illnesses. [ix] Diagnostic and Statistical Manual of Mental Disorders- prepared by American Psychiatric Association- the list of psychiatric diagnoses and their definitions that helps to prepare statistic and epidemical calculations on the world’s scale. [xi] Nussbaum, M., Giustizia sociale e dognitá umana. Da individui a persone. Bologne: Il Mulino 2001/2002, p.78. [xii] Aloia M., Grębowiec Baffoni J., Pamiętniki z Columbine. Możliwości profilowania kryminologicznego na podstawie analizy grafoojęzykowej pisma [in] Kegel Z. [red.] Współczesna kryminalistyka i nauki pokrewne w administracji, PWSZ, Wałbrzych, 2013 p. 201-220. [xv] “Kriminalistik“,3/85 [in] Bradner, W.